Bongongo is one of the oldest registered herds in Australia. The stud was established in 1926 by Fred Graham with the purchase of pure bred females from “Bald Blair”, Guyra. The stud was run by the Graham brothers, under the stewardship of Fred, until his untimely death in 1950. Early sire introductions came from Abington, Kahlua, Wallah, Trangie, Wambanumba and Booroomooka studs. Fred’s nephews H.L (Bill) Graham (pictured below) and Bruce Graham developed the herd over the next forty years, overseeing a large increase in its commercial base. The herd developed to suit its environment in the colder temperate climate at Adjungbilly, near Gundagai and Tumut, in Southern NSW. From 1961, they ran very successful female on-property sales, a concept that became popular as Angus developed into the dominant breed over the last 35 years. 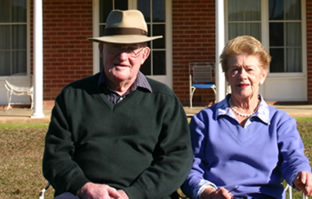 Generational change saw the stud passed to Bill (jnr) and his wife Shauna in 1999. It is now based at Riverview on the banks of the Murrumbidgee River between Coolac and Jugiong on the South West slopes of NSW. Bill’s brothers David, John & Paul all run their own large commercial herds with similar production goals of fertile self-replacing herds producing premium steers for the feedlot industry. The Bongongo herd topped the original AMH Marbling trial at Caroona Feedlot in 1994. The stud has grown to over 700 registered breeders today and the number of bulls sold each year has grown with it.